...and be sure to check out the newest releases...you will NOT be disappointed! Gorgeous card, Pryn! I love the vintage colors and papers! Wonderful design! Hugs to you, sweet sistah! 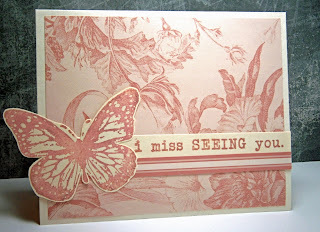 Pryn, Love the softness and sweetness of your card! So very elegant! Hugz "The Mostest!" This is a beautiful card. Love the softness of this card. This is such a pretty card! Love how you matched the color of the PP so perfectly! This is an awesome monochromatic creation! This is pretty maybe that butterfly with fly to my house? I love it! Gorgeous card - pretty colors and fun placement!! - love this kotm too!! I totally know the feeling with all the great stuff at Unity!! This is terrific and I love the pink! What a beautiful monochromatic card!! Wow, this is soooooooooo elegant. Absolutely lovely!! Pryn this is just gorgeous, I love the elegance and simplicity of this card with the beautiful monochromatic colour scheme and butterfly. Pryn... this is soooooooo pretty. I love the monochromatic colors and that great big butterfly is gorgeous. I have never heard of these stamps, they are beautiful! I followed you from Outlawz and thanks for the warm welcome! I look forward to following you! Your card is gorgeous! I love everything about it.. I am now a follower, found you at the Outlawz.